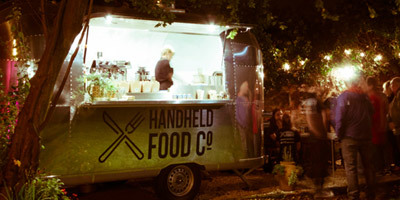 We’re available all year round for street food events, weddings, private dining, parties and festivals. We can also offer you the use of our private garden with our fully licensed pop up bar and food of your choice. If you’d like to give your own review please visit our facebook page and leave us some kind words! 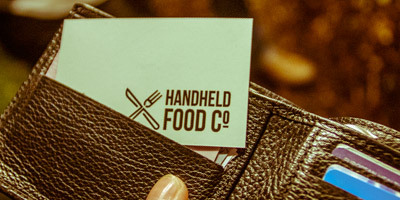 Handheld Food Co were the most amazing people, they gave my son and his new wife the day they’d dreamed of. 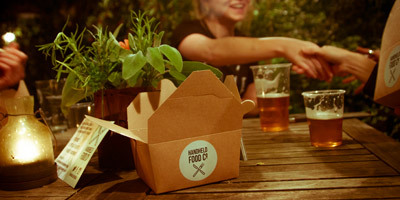 The food was outstanding, the professionalism was unbelievable and the pop up bar was ingenious. Thank you Steve and Sam for everything. 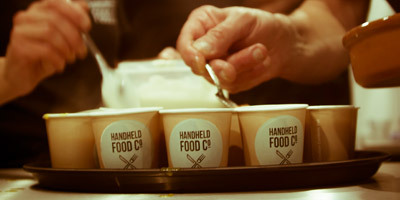 When we hired Handheld Food Company to take care of our special event we immediately felt like we were in very safe hands. Everything was taken care of, Steve and Sam were excellent hosts, meaning we could enjoy ourselves too! I had the most AMAZING lunch of proper sausages & creamy mash with yummy onion gravy. I’ve eaten here a few times now and it’s always delicious. I’m impressed by the attention to detail, amazing coffee from a proper machine and brownies to die for! Thank you all so much for the most amazing evening, the food was on point, all four of you where a delight to meet as well as having you chef up an array of Tapas! Would happily recommend to anyone who is thinking of doing any type of event. Thanks again.